David Lanster puts a charge into a ball for a double. It was a victory that came late for Palmer Trinity, but as long as it got there the Falcons were happy. It wasn’t until the sixth inning that the Falcons bats came alive for six runs to pave the way to a comeback 9-5 victory over Ransom Everglades. The Falcons (3-1-1) managed to bat around the order in the bottom part of the fifth to take the lead. They showed good pitch selection to pile up four walks, two doubles and a single. 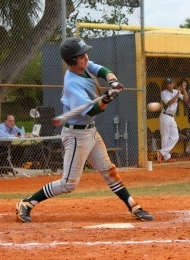 The scoring was started off by an RBI double from Daniel Chumbley. Later in the inning, Evan Steinman came up big with a base-clearing double to cap off the big frame. The Raiders (0-5) came into the game looking for their first win of the 2014 season behind the arm of Jake Archer, who was making his first career varsity start. “I was sort of nervous,” said Archer. “I was throwing a few balls, but after the first inning I started throwing strikes so I was kind of confident.” Archer showed tremendous poise on the mound, going four innings allowing two runs and striking out four. As for the Falcons, they had senior Julian Stark on the mound, and Stark gave them five innings while allowing two earned runs. It was enough to keep the Raiders close for the offense to rally back later on in the game. The Raiders bats were opportune through the beginning of the game, scoring three of the first five runners that reached scoring position. They were the ones to break the ice in the first with an RBI single from Ricky Suarez scoring David Lanster, who got on base with a one-out double. The Falcons responded in the bottom half with a walk to Evan Steinman followed by an RBI triple to right-field by shortstop Jarrett Pico. Daniel Chumbley connects for an RBI double. The Raiders added to their lead in the forth without the ball having to leave the infield. 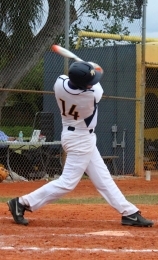 Ryan Moralejo reached base on an error and Danny Halula got an infield hit, followed by a sac bunt from Josh Greenspan. Chris Rossi later capitalized with a squeeze play, scoring Moralejo. Palmer Trinity answered back with a two-out double from Nick Font to score Matt Roberts, who reached on a single to leadoff the inning. After the Falcons came alive to take control in the fifth, Roberts brought Chumbley around to score on an infield hit for the Falcons in the sixth. Chumbley later came on in relief to cap off a productive afternoon, striking out four in two innings of work while allowing one unearned run in the seventh. The Raiders were close to obtaining their first victory of the year until the Falcons came alive in the fifth. Manager Steve Suarez acknowledged it has been their Achilles heel this season. As for the winning manager, although his Falcons got the victory Harvey wasn’t ready to celebrate. Despite their struggles for much of Thursday, Harvey still has confidence in his team.